The movie was absolutely great. Truly brilliant. 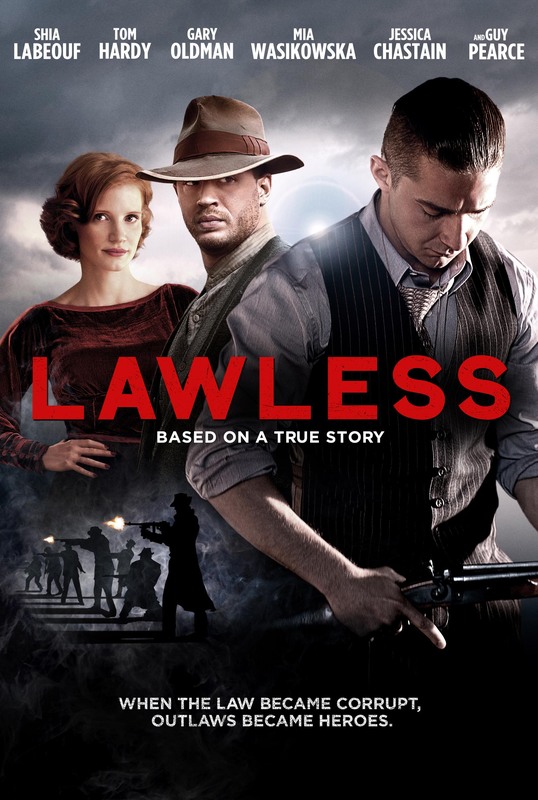 I know that a lot of people take issue with certain things in it, but I cannot tell you how I get when I sit down to watch Lawless. I am like a giddy child that got to pick out anything I wanted to watch. I can’t count anymore how many times I have seen this since the first time, but it gets better and better. The cast is absolutely phenomenal, and carried this story, and each and every one of the actors and actresses in this is excellent. Tom Hardy is amazing. We all know that I adore the man, and Lawless is no exception. The man is a master and well worth watching – always. His portrayal of Forrest Bondurant is impressive. Guy Pearce is beyond reprehensible and Rakes truly gets under your skin. I have always admired Jason Clarke, but this is where I fell in love with him – Howard is insane, loyal, jaded, cuckoo crazy. Shia LaBeouf should be commended for his role of the youngest Bondurant brother, Jack. Why? Because, as cooked as he may be in real life, he is a solid and consistent actor. I thought he and Mia Wasikowska had lovely chemistry, and they played off of each other nicely. Bertha is just too damned sweet for words. Then I have got to talk about Dane DeHaan. I am a junkie, we all know this, and his portrayal of Cricket is wonderful. He is a character we all fell in love with, whom we adore because you cannot help but like Cricket, and it is easy to understand why he is favouried. Lastly, but certainly not least, there is Jessica Chastain. Beautiful, regal, Red. The moment she stepped onto the scene the Bondurants had no idea what was going on anymore, and I love how awkward the brothers could get around her. I love the way the film was shot, it is beautiful and engaging, and the plot progression could not have been done better – not too long, not skipped over, every part is given sufficient time to make itself comfortable and relay the epic story of the bootlegging brothers. The score is perfectly suited, and I had such a blast with the humour in the film too. There is some heavy violence, but no violence just to be nasty. It all serves a purpose. I think by this write up you can tell that I am a huge fan of this and think that this film has a lot going for it, and I would highly recommend checking it out! This entry was posted in Movies and tagged Bondurant Brothers, Charles Rakes, Dane DeHaan, Forrest Bondurant, Gary Oldman, Guy Pearce, Howard Bondurant, Jack Bondurant, Jason Clarke, Lawless, Mia Wasikowska, Shia LaBeouf, Tom Hardy, Wettest County in the World. Bookmark the permalink. I am so FREEEEEEEEEEEEEE!!!!!! Dobby got a sock. I am so, so glad we are in agreement. This film is awesome, and totally needs your love and attention! Botany Kidney xD I think you like this less than Chemistry Kidney! This was one of my most anticipated films of that year. It didn’t quite live up to my expectations but Hardy was good. And how about Guy Pierce? I thought he stole several scenes. I am sorry to hear that 😦 Hardy was excellent, and Pearce? Ugh, what a disgusting character! So well played! No I liked it quite a bit. I had just elevated it to a can’t miss classic before it ever even hit theaters. My bad. Hahahaha. Maybe it is a good thing we missed any and all marketing here! That’s a really talented cast and a wonderful review Zoe. Actually really liked this, despite the general consensus. I also felt like Pearce was so good, it would have been great to see him get an Oscar nod. But oh well. Nice review Zoe. I’ve heard mixed things on this film but your review makes me want to see it Zoe. You have a real gift for this.